So far, I've focused most of my week with yoga at studios, but today, my yoga was at home so that my friend, Vicki and I could go experience a Russian banya. I wasn't really sure what to expect--so I was glad Vicki was up for the adventure. We went into the Banya, gave our phones, keys and wallets to the man at the desk who locked them in the safebox that corresponded to the locker we were assigned. He then handed us a robe, shoes, a lock for the lockers and towels and showed us around. 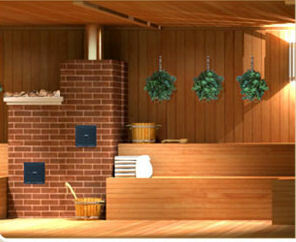 The venik treatment is a type of massage done with a wet broom made of leaves...eucalyptus, birch and/or oak. Jacob--the massage therapist explained all the benefits, and I know it sounds odd, but it is actually pretty fantastic. Then once the treatment is finished....yes, you guessed it....ice pool and I screamed like a girl. Other than that, you basically hang out in a robe in between times of hanging out in the sauna. We ordered hot tea because we were advised to heat our insides as well as our outsides. We also had lunch while lounging about in robes (totally decadent) and they had a beet salad--which meant I didn't have to abandon my raw food regimen. Very interesting!! I can't really imagine all day in a robe with people serving/pampering me!! Although, I think I could learn! As Vicki detailed it...I don't know if I could go for the WHOLE Venik treatment...I can't even imagine that either!! I can't imagine why it feels so nice...or how someone thought it up in the first place!? But...very interesting. Thanks for writing about your "week as..." - I can't wait to see what happens tomorrow!